Providing you the best range of chemo copper bonded earthing electrode, copper bonded electrode, copper cladding / bonding earth rod and cu coated chemo earthing electrode with effective & timely delivery. We are offering our customers with Chemo Copper Bonded Earthing Electrode. These products are manufactured with superior quality electrolytic copper, procured from the finest vendors in the industry. Our team of experienced workforce make use of sophisticated technology and tools in designing highly effective products. In order to fulfill the ever changing demands of our clients, we have been engaged in offering a plethora of Copper Bonded Electrode. These electrodes are developed and designed using high tensile low carbon steel. Our products are molecularly bonded with pure electrolytic copper which enhances its service life. Further, these products are ideal driven earth electrodes with minimum thickness and are widely used in pipeline industry. Clients can avail these products from us at nominal rates. Our domain expertise has enabled us to come with an exclusive range of Copper Earthing Electrodes comprising best quality copper. These Electrodes are available in many sizes with outstanding quality as per the needs and requirements. We also provide the facility of customizing products in accordance with customer's demands. Our products are having high tensile strength and are corrosion free having a longer life span. Uniform copper plating and high corrosion resistance. 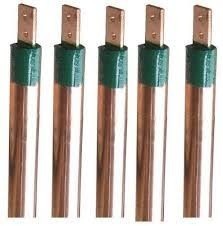 With the help of experienced professionals, we are engaged in offering fine quality CU Coated Chemo Earthing Electrode. These electrodes are manufactured using quality approved raw material in compliance with industry laid norms and guidelines. All the earthing electrodes offered by us are widely used in regions of high soil resistivity. Further, a team of deft experts make sure that all these products are delivered at clients' loaction within the committed time-frame.